The luminous quality and shining colours in this gorgeous bracelet from Carrie Elspeth make it perfect for evening wear, but you may want to wear it every day! 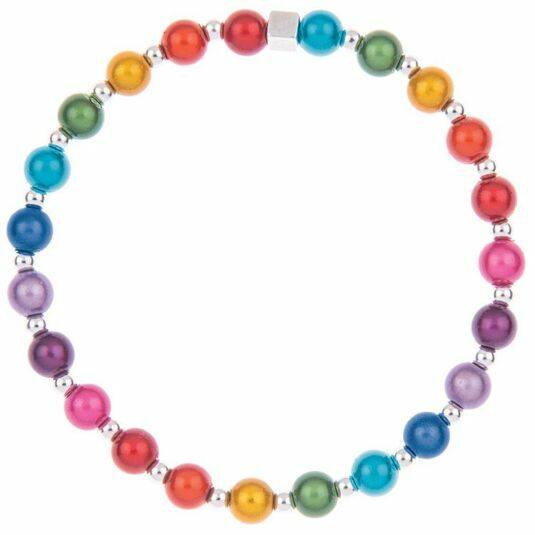 The beads are a classic pearl shape, shining globes in rainbow shades are separated by small silver coloured spacer beads to allow each colour to be fully revealed. This richly coloured bracelet is ideal for parties and special events, and will also brighten an everyday outfit. Combine with matching items to create a sophisticated look! Miracle beads are made from resin with a lacquered surface which gives them a highly glossed shine. The result is a bead with a wonderful luminescent quality which reflects light beautifully, making them ‘glow’. A beautiful piece of jewellery in its own right, this bracelet is also designed to work with the matching necklace and earrings to bring the whole set together. The beads are strung along the full length of the bracelet in the full colour spectrum. The jewel-like colours revive and update the classic string of pearls, breathing new life into a wardrobe staple. Carrie Elspeth bracelets measure approximately 7" (19cm) around, and this design stretches a little to fit nicely on the wrist.